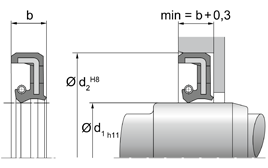 The WASY is a single-action rotary shaft seal for rotating or pivoting shafts with optional protective lip sealing action (WASY) on the side facing away from the medium, against dirt accumulation from the outside. 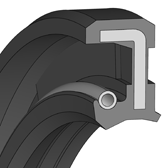 The shorter, thicker, spring-energised sealing lip enables pressure application of up to 10 bar (depending on the rotational speed). The elastomer outer sheath provides good static sealing, good thermal expansion balance, e.g. in light-metal housing, better sealing with greater roughness and secure sealing for split housings as well as good static sealing with thin fluid or gaseous media. The nominal widths mentioned on the following pages represent the standard dimensions. They are generally in stock or can be delivered at short notice. Other dimensions and different designs, e.g. springs or metal inserts made of other steel grades can be produced as well as some special designs. Minimum quantities may be obligatory for dimensions outside of the standard.